Persimmons, when perfectly ripe, contain about 34% fruit sugar. Notice I said when perfectly ripe. When they are less than perfectly ripe, they are terribly bitter, so knowing when to pick persimmons at their peak is essential. But how do you know when persimmons are ripe? 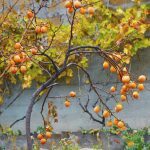 Read on to find out about harvesting persimmon fruit, including when and how to harvest persimmons. American persimmons grow wild throughout a large area of the rural United States, from the Ozarks to the southern Gulf States up into parts of Michigan and the Great Lakes. They produce fruit that is plum sized and quite astringent unless fully ripe and soft. Oriental persimmons are a little larger, the size of a peach, and are not nearly as hardy as the native varieties. Oriental persimmons are of two types: astringent and non-astringent. Both ripen at different times, so it’s important to recognize what type of tree you have before picking the persimmons. 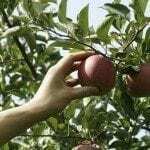 Ideally, you would let astringent varieties ripen on the tree until they are soft. Wild persimmons do not ripen all at one time. 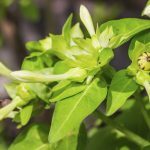 They may become ripe as early as mid-September or as late as February. Unfortunately, the birds love the ripened fruit as well as the deer, raccoons, etc. So begin picking persimmons in the early fall when the days are still a bit warm, and the fruit is hard but fully colored. Let them ripen at room temp in a cool, dry area until they are soft. Non-astringent types of persimmon are ready to harvest when they a have a deep flushed apricot hue with pink overtones. They are ripe and ready to eat at harvest unlike astringent persimmons. While you can let them soften up, this doesn’t improve the flavor. As mentioned, ideally, you would harvest wild or astringent persimmons when the fruit is fully ripe and ready to fall from the tree. However, due to the wildlife competition and the fact that fully ripe fruit bruised easily, wild persimmons are usually harvested early and allowed to ripen off the tree. Cut the fruit from the tree with either hand pruners or a sharp knife when harvesting persimmon fruit. Leave a bit of the stem attached. Don’t stack them in a basket, as they easily bruise. Lay the harvested fruit in a shallow tray in a single layer. Allow the fruit to ripen at room temperature or store in the refrigerator for up to a month or frozen for up to 8 months. If you wish to hasten the ripening process, store the persimmons in a bag with a ripe apple or banana. They give off ethylene gas that speeds the ripening process. Non-astringent persimmons can be stored at room temp, albeit for a shorter period of time than their wild cousins. The same is true of storing in the refrigerator.